Background and Objectives: Urinary incontinence is a problem that creates both physical and psychological nuisance to a woman. This problem needs to be studied in detail in Indian population because of lack of precise data. The objectives of this study were to study the prevalence and risk factors of urinary incontinence in Indian women. Materials and Methods: This hospital-based cross-sectional study conducted from August 2005 to June 2007 included women attending gynecology OPD (consulters) and hospital employees (nonconsulters). Subjects who were incontinent were asked a standard set of questions. Incontinence was classified as urge, stress, or mixed based on symptoms. A univariate followed by multivariate analysis was done to look for risk factors. Results: Of 3000 women enrolled, 21.8% (656/3000) women were incontinent. There was no significant difference in incontinence rate between consulters and nonconsulters [618/2804 (22.1%) vs. 38/196 (19.4%); P value = 0.6). Of the total women having incontinence, highest numbers were found to have stress incontinence [73.8% (484/656)] followed by mixed [16.8% (110/656)] and urge incontinence [9.5% (62/656)]. Age more than 40 years; multiparity; postmenopausal status; body mass index more than 25; history of diabetes and asthma; and habit of taking tea, tobacco, pan, and betel are risk factors found to be associated with increased prevalence of urinary incontinence in univariate analysis. On multivariate analysis, age more than 40 years, multiparity, vaginal delivery, hysterectomy, menopause, tea and tobacco intake, and asthma were found to be significantly associated with overall incontinence. Stress incontinence was separately not associated with menopause. Urge incontinence was not associated with vaginal delivery. Conclusion: Urinary incontinence is a bothersome problem for women. Simple questionnaire can help to detect this problem and diagnose associated risk factors, so that necessary steps can be taken in its prevention and treatment. Urinary incontinence is a common problem with widespread human and social implications causing discomfort, shame, and loss of self-confidence. It not only affects the quality of life but also has significant cost implications. Although several large-scale studies have focused on epidemiology of urinary incontinence in women of western countries, limited data are available from Asian countries. This population differs from western population both constitutionally as well as behavior wise. Thus, it is of great importance to try to define prevalence and possible etiological factors with a view to subsequent prevention. Although some risk factors for incontinence have been studied, still several important predictors of incontinence remain uninvestigated. For example, cigarette smoking has been shown to have a positive association, and the relationship between tobacco chewing, other form of nicotine intake, and tea intake, a very commonly used drink in south East Asian region, has not been elucidated. Studies of the association between hysterectomy and incontinence have reported conflicting results. Moreover, very few studies have analyzed the risk factors for different types of urinary incontinence separately. In this cross-sectional study, analysis has been done in India on frequency and risk factors of urinary incontinence and its various subtypes. This single-center cross-sectional study was conducted in the department of obstetrics and gynecology at our center from August 2005 to June 2007. All women aged more than 18 years attending obstetrics or gynecology OPD were screened for urinary incontinence by a doctor based on history and then included in the study. The entry question was whether or not the participant experienced involuntary loss of urine. If the answer was yes the woman was categorized as having any incontinence. 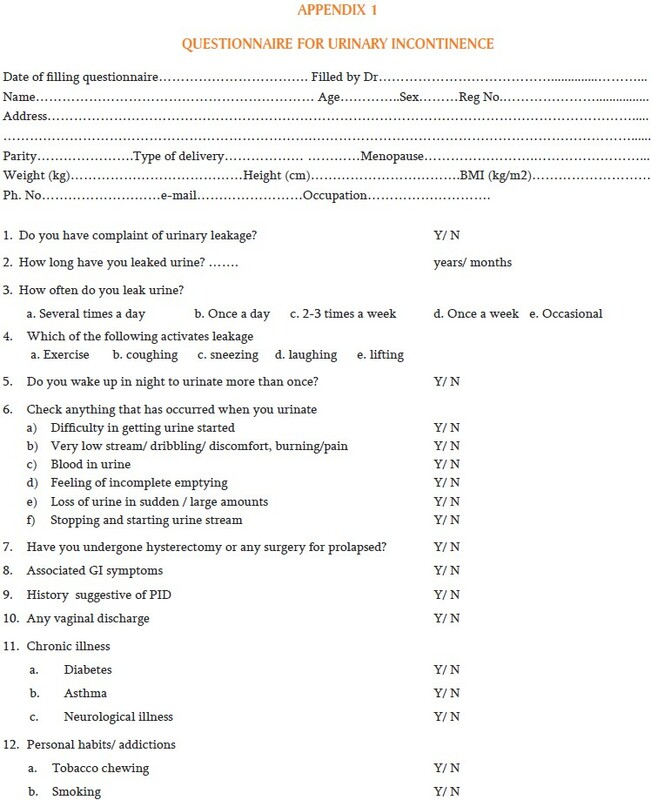 Subsequently, a standard questionnaire was asked by a doctor to know the clinical and demographic profile [Appendix 1 [Additional file 1]]. Incontinence was categorized as stress, urge, or mixed type. Women who confirmed involuntary loss of urine in connection with coughing, sneezing, laughing, or lifting heavy items were classified as having symptoms of stress incontinence. Those whose involuntary loss of urine was connected with a sudden and strong urge to void were classified as having urge symptoms. If there were urge and stress symptoms, then subjects were classified as having mixed incontinence. Also women employees of the same hospital who were otherwise healthy were also screened for incontinence. Subjects enrolled from OPD were labeled as consulters and hospital employees were labeled as nonconsulters. Data analysis was done by using SPSS version 10. Continuous data are presented as mean + SD. Student's t-test was used to compare means and chi-square test was used to compare discrete variables. Data are presented as 95% CI. Of the 3000 women enquired, 2804 (93.4%) were consulters and 196 (6.5%) were nonconsulters. Overall frequency of incontinence was 21.87% (656/3000) [Table 1]. Of the total women having incontinence, highest numbers were found to have stress incontinence [73.8% (484/656)] followed by mixed [16.8% (110/656)] and urge incontinence [9.5% (62/656)]. In consulter group, total incontinence was 22.3% (458/2804) with highest number of stress incontinence [74.1% (458/618)] followed by mixed incontinence [16.8% (458/618)] and urge incontinence [9.1% (56/618)]. In nonconsulters group, total incontinence was 19.3% (38/196). Stress incontinence was commonest [68.4% (26/196)] followed by same prevalence of urge and mixed incontinence 15.8% (6/196) of both. It was seen that prevalence was low in women upto 30 years of age (7.5% and 11.6% in women <20 years of age and between 21 and 30 years of age). 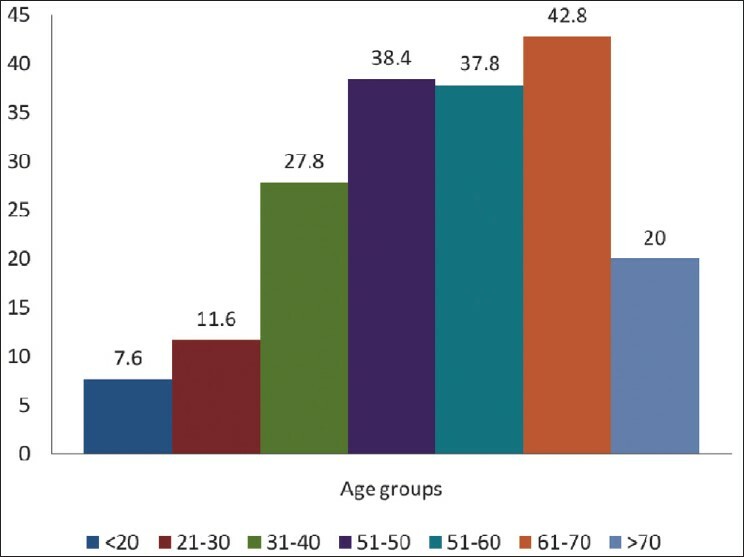 In women above 30 years of age, the prevalence ranged from 27.8% to 42.8% with maximum prevalence in the age group of 61-70 years of age [Figure 1]. There is marked difference in frequency of incontinence between women below 40 years of age (median age of our study population) and women above 40 years of age. All types of urinary incontinence were found to be significantly higher among women above 40 years of age (P < 0.001). Incontinence was found to be positively associated with increasing parity. Differentially stress incontinence showed an increasing trend with increasing parity. However, in case of urge incontinence, prevalence was high only in grand multiparous women, while it was similar in nulliparous and women of low parity (P = 0.244 and 1.35) The prevalence of all types of urinary incontinence was significantly higher in postmenopausal women and women who have had hysterectomy (P < 0.05) [Table 2]. The prevalence of urinary incontinence was 20.77% and 26.25% in women with body mass index less than or equal to 25 and more than 25, showing a significant difference between the two (P < 0.004). Among different types, stress and mixed but not urge incontinence were significantly associated with BMI >25 [Table 3]. Among chronic medical disorders, diabetes was not associated with increased prevalence of any type of incontinence (P = 0.863), while COPD was associated with increased risk of having all types of incontinence (P < 0.05). Mode of vaginal delivery had a significant impact on prevalence of overall and stress incontinence, prevalence being higher in women having even one vaginal delivery. Stress incontinence has a stronger relationship than urge and mixed incontinence. There was no significant difference in incontinence for nulliparous and women having caesarean section only except for a slightly increased risk of mixed incontinence (P = 0.041). The prevalence of overall and stress incontinence was significantly higher for persons with habit of tea intake (P = 0.010 and 0.011), while the prevalence of urge and mixed incontinence showed no significant association with tea intake. Prevalence of all types of incontinence increased with tobacco and tea intake. Multivariate analysis showed that in mixed and stress incontinence except for age and body mass index (BMI), all the variables parity, personal habit, delivery type, history of hysterectomy, and asthma were significantly associated with complaints of incontinence [Table 4]. In urge incontinence apart from age and BMI, delivery type too did not show statistically significant association with complaints. In this cross-sectional study, urinary incontinence was self-reported and diagnosis was based on answers to leading questions about symptoms of urinary incontinence. This study provides an opportunity to analyze the prevalence and determinants of different types of urinary incontinence separately in a large series of subjects using standard methods for recording symptoms. The questionnaire directly filled by physician increases the reliability of diagnosis of various types and risk factors of incontinence. Out of 3000 women, 656 women reported urinary incontinence and prevalence was 21.87%. In various studies using ,, the same definition on similar population, prevalence was 25-45%. Other studies , using the same population but different definitions (any leakage in previous 30 days) reported a prevalence of 35-37%. In our study, the prevalence of stress, mixed, and urge type was 16.13%, 3.67%, and 2.07%, respectively. This was similar to most of the other studies (2, 7) , in which also stress incontinence was the commonest type. Only few studies  found mixed incontinence to be commonest type. In our study, prevalence of urinary incontinence in young women (18-30 years) was only 9% which is strongly in contrast t 52% reported by Nemir and Middleton  and 51% reported by Wolin  studied among college students. Significantly high prevalence (38.4%) in women above 40 years is similar to most of the other studies , where it ranges from 36 to 43%. Significant relationship between parity and incontinence was found to be similar with other studies. A definite trend of increasing prevalence in all types of urinary incontinence with increased parity suggests cumulative effect. Comparable results were obtained by Swash  who concluded that injury to the innervation of pelvic floor is worsened by successive deliveries. Pregnancy and child birth are regarded as key environmental determinants of urinary incontinence, and more than 60% of incontinent women associate its onset with pregnancy, child birth, or postpartum. However, the impact of birth mode on incontinence and possible protective role of caesarean section have remained the subject of intense debate. In our study, prevalence of urinary incontinence is maximum among group with vaginal delivery (26.84%) which was significantly higher than nulliparous women (9.42%) and caesarean deliveries (8.59%). This is in agreement to many studies , that showed increased prevalence of urinary incontinence after vaginal deliveries. Urge and mixed incontinence showed least significant association with vaginal delivery. Parazzini  also did not find increased risk of urge incontinence after vaginal delivery (OR 0.7). There may be association between hysterectomy and stress incontinence. The most biologically plausible rationale for this association is surgical trauma caused when uterus and cervix are severed from pelvic floor supportive tissues at the time of hysterectomy. Hysterectomy could interfere with intricate urethral sphincter mechanism by damaging distal branches of pudendal nerves and inferior hypogastric plexus but it might also result in changes in bladder and urethral neck support. In our study, a significant association between hysterectomy and all types of incontinence was found (P = 0.001). However, results of various studies are conflicting. Burgio et al  and Eva Samuelsson  found no significant association between hysterectomy and urinary incontinence. In a meta-analysis, Brown et al  found a significant increase in the odds of incontinence after hysterectomy. There are studies showing association between coffee, alcohol, smoking, and incontinence. In this study, effect of tea and tobacco intake is studied which shows significant association with overall and stress incontinence. Norwegian Eppincott  study evaluated the effect of tea intake and concluded that tea drinkers were at slightly higher risk for all types of incontinence. Tea is caffeinated drink. The caffeine content of tea is approximately one-third of coffee. Various studies show conflicting effects of coffee intake on incontinence. Arya et al  reported that high caffeine intake is related to detrusor instability, while Burgio  reported no effect of coffee on incontinence. In this study, tobacco chewing was associated with increased frequency of incontinence. Sampselle  reported 38% increased risk of incontinence among smokers. Other studies also confirm this view. Smoking effects continence by damage to urethral sphincter mechanism by frequent coughing, decrease in collagen synthesis, and smoking-related vascular diseases. With regard to medical history, role of type 2 diabetes is not completely understood. In this study, no significant difference was found in diabetics (P = 0.86). Further studies are required to solve this issue. Asthma is associated with significant risk of urinary incontinence (P < 0.01). Parazzini  reported similar results in his study. Urinary incontinence is a very distressing problem. With the help of simple questionnaire, burden of disease can be estimated. Knowing about prevalence and risk factors of urinary incontinence is very important, so that necessary steps in its prevention and treatment can be taken. 1. Sandvik H, Hunskaar S, Vanvik A, Bratt H, Seim A, Hermstad R. Diagnostic classification of female urinary incontinence: An epidemiological survey corrected for validity. J Clin Epidemiol 1995;48:339-43. 2. Hagglund D, Olsson H, Leppert J. Urinary incontinence: An unexpected large problem among young females. Results from a population-based study. Fam Pract 1999;16:506-9. 3. Hannestad YS, Rortveit G, Daltveit AK, Hunskaar S. Are smoking and other lifestyle factors associated with female urinary incontinence? The Norwegian EPINCONT Study. BJOG 2003;110:247-54. 4. Yarnell JW, Voyle GJ, Richards CJ, Stephenson TP. The prevalence and severity of urinary incontinence in women. J Epidemiol Community Health 1981;35:71-4. 5. Samuelsson E, Victor A, Tibblin G. A population study of urinary incontinence and nocturia among women aged 20-59 years. Prevalence, well-being and wish for treatment. Acta Obstet Gynecol Scand 1997;76:74-80. 6. Kinchen KS, Burgio K, Diokno AC, Fultz NH, Bump R, Obenchain R. Factors associated with women's decisions to seek treatment for urinary incontinence. J Womens Health (Larchmt) 2003;12:687-98. 7. Sommer P, Bauer T, Nielsen KK, Kristensen ES, Hermann GG, Steven K, et al. Voiding patterns and prevalence of incontinence in women. A questionnaire survey. Br J Urol 1990;66:12-5. 8. Peyrat L, Haillot O, Bruyere F, Boutin JM, Bertrand P, Lanson Y. Prevalence and risk factors of urinary incontinence in young and middle-aged women. BJU Int 2002;89:61-6. 9. Nemir A, Middleton RP. Stress incontinence in young nulliparous women: A statistical study. Am J Obstet Gynecol 1954;68:1166-8. 10. Wolin LH. Stress incontinence in young, healthy nulliparous female subjects. J Urol 1969;101:545-9. 11. Chiarelli P, Brown W, McElduff P. Leaking urine: Prevalence and associated factors in Australian women. Neurourol Urodyn 1999;18:567-77. 12. Danforth KN, Townsend MK, Lifford K, Curhan GC, Resnick NM, Grodstein F. Risk factors for urinary incontinence among middle-aged women. Am J Obstet Gynecol 2006;194:339-45. 13. Snooks SJ, Swash M, Mathers SE, Henry MM. Effect of vaginal delivery on the pelvic floor: A 5-year follow-up. Br J Surg 1990;77:1358-60. 14. Bortolotti A, Bernardini B, Colli E, Di Benedetto P, Giocoli Nacci G, Landoni M, et al. Prevalence and risk factors for urinary incontinence in Italy. Eur Urol 2000;37:30-5. 15. Parazzini F, Chiaffarino F, Lavezzari M, Giambanco V. Risk factors for stress, urge or mixed urinary incontinence in Italy. BJOG 2003;110:927- 33. 16. Burgio KL, Matthews KA, Engel BT. Prevalence, incidence and correlates of urinary incontinence in healthy, middle-aged women. J Urol 1991;146:1255-9. 17. Brown JS, Sawaya G, Thom DH, Grady D. Hysterectomy and urinary incontinence: A systematic review. Lancet 2000;356:535-9. 18. Arya LA, Myers DL, Jackson ND. Dietary caffeine intake and the risk for detrusor instability: A case-control study. Obstet Gynecol 2000;96:85-9. 19. Sampselle CM, Harlow SD, Skurnick J, Brubaker L, Bondarenko I. Urinary incontinence predictors and life impact in ethnically diverse perimenopausal women. Obstet Gynecol 2002;100:1230-8.